Global 6K Walk for Water! THIS SPRING, CHANGE A LIFE. Join thousands of people across the globe in a mission to bring life-changing clean water and fullness of life to children in communities around the world. 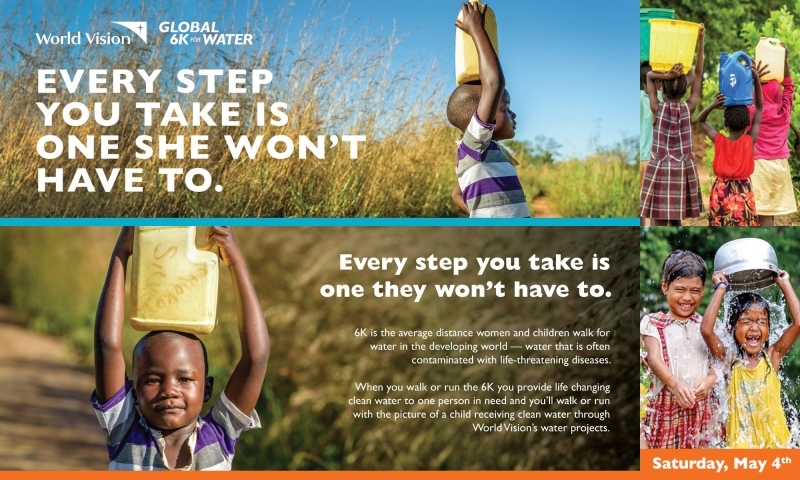 Walk, run, or push a stroller at the World Vision Global 6K for Water on May 4, 2019 in Havre. Each registration provides lasting clean water to a child, like the child on your race bib! If you won't be able to attend the 6K, please consider supporting the local World Vision team by donating.The link below takes you directly to the local team page, but you must also "join a team" and enter Walk4Water when you register (do not select individual).